It’s good fun and slightly annoying being a Colwyn Bay fan. With its location on the North Wales coast, we don’t have any real local rivals. Instead, people actually enjoy us as an away day – particularly if we are an away day in August towards the end of the season. 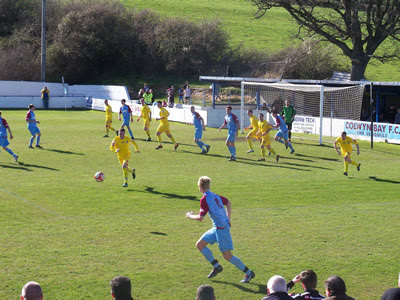 Couple that with a warm welcome and smiles, and it’s no surprise that Colwyn Bay have been given the battle hardened nickname as “lovely” before now. Not that we’re battle hardened. An unpleasant period in the history of the club which saw the club almost forced into the League of Wales (a fate worse than administration) with Newport County & Merthyr Tydfil in the early 90’s. A period in exile at Northwich Victoria’s Drill Field followed, before returning in 1995. 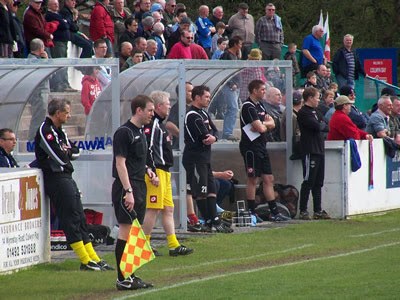 After relegation and a promotion in the 15 years at Llanelian Road, Colwyn Bay were sitting second in the Evostik Premier League. In a sad sense of irony, the visitors on the 2nd April were Retford United, a team who suffered relegation in the previous game. 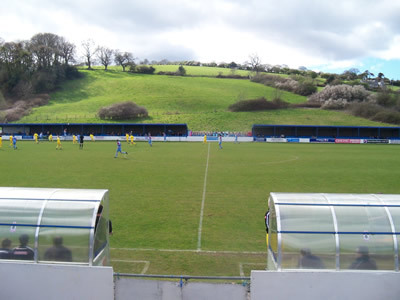 The last time the Badgers were visitors to North Wales, it was the first game after winning promotion to the Evostik Premier. Since moving to Manchester, my trips to the Berna-bay (nice - Ed.) have been infrequent and it showed in the mile and a half walk through woodland and over hills taken to get to the ground. I used to bound merrily to the game, but a year in the big smoke of the North resulted in the walk becoming a major struggle. The marshland that I used to walk across like David Copperfield over water became a Bambi-on-ice esque dance. I arrived at the clubhouse and bought a programme – something I never do, but it is with good reason. 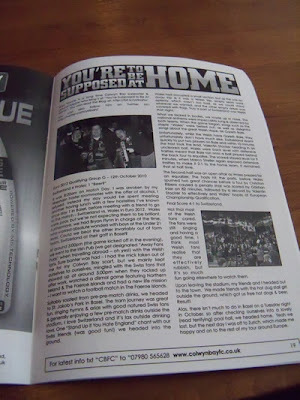 It wasn’t just the fact I was in the programme. I wanted to experience the Colwyn Bay experience a lot more. This was only my third home game of the season, and a lot has changed. Bay are trying to create a punk footballing culture with spray painted murals on the stands. It remains to see if it works. Following a pre match presentation of Manager of the Month to Lord of the Long Throw Dave Challinor and a minute silence for long time fan Ken Jackson’s passing, the game kicked off. With the wind at their back, relegated Retford surprisingly pushed, with the Bay hitting them on the break. With that said, with a consistent 9 behind the ball at any one time, The Badgers struggled, and their lone striker dwarfed by the Seagulls two centre backs, resorted to diving a fair bit to try and win free kicks. The referee was having none of it. The referee didn’t have the best games. The tone was set early on when a blatant Retford pass back went unpunished. Furthermore, he stopped the games for seemingly pointless reasons, yet let tackles of a yellow card nature pass. Despite being under the kosh, Colwyn Bay had the better chances, with Jimmy McCarthey and Rob Hopley linking up well, the latter having two decent chances (one of which was a bicycle kick), and getting the ball into the net, only for him to be ruled offside. Retford’s few chances went high and wide, that earned the ire of the Retford’s Manager, who screamed like a Scottish banshee. The half time whistle blew and honours were even in a feisty, yet scrappy first half. Lovely bubbly. 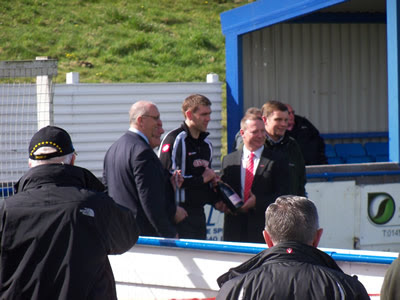 Dave Challinor receives his Manager of the Month plonk. Yes, that Dave Challinor. Following a second half break of a coke in the glorious sunshine, the players came out. With Chally’s words and the wind behind them, the Bay started brighter, pressing heavily but not getting a goal, Jon Newby forced a save from Retford keeper David Darwent, and Rob Hopley had the ball in the net, only to be denied for hand ball. Retford also had their chances, forcing Chris Sanna into two comfortable saves from Michael Blythen. With the game deep into the last third, Challinor threw on Alex Titchiner. The Bay fans like Alex, a talented ex Crewe Alexandra youngster affectionately known as “Titch”. A player who isn’t short of energy, he hasn’t quite been as prolific as he (nor we) would’ve liked. Unlike other large signings who have been less than prolific at their new clubs, Titch’s effort is applauded by the Seagulls faithful. In fact a bet was launched on Betfair entitled “Titch vs. Torres” – Alex’d score his first goal for Colwyn Bay before Fernando Torres scored his first goal for Chelsea – a bet that paid out when he bagged his first goal against Frickley. Despite the love for Titch, a large number of Bay fans thought that his introduction on the 85th minute was a little too late, and started leaving the ground in droves. Unfortunately for them they missed the only goal in the game, when a goal line scramble lead to Titch slotting in the goal on the 87th minute to put the Seagulls one nil up. Yes they should’ve destroyed Relegated Retford, but by goodness if they saw out the remaining 3 minutes plus injury, we didn’t care, the play-offs push and the dizzy heights of the Blue Square Conference North (or South, if in the unlikely event that the entire of Birmingham is relegated) beckoned. Retford were dejected, the banshee silenced for good this time, and another notch in the loss was chalked up. We retired to the bar where we enjoyed a lovely Llangollen Welsh Stout, scones and clotted cream that were leftovers from the corporate hospitality, and the award to the man of the match (Jimmy McCartney). Retford fans sung their song, which was admirable – they got a lot more support than a lot of other teams get. Alas, trips to the Berna-bay have been few and far between, but fingers crossed I get two more before the season closes. The games I hope to attend at Llanelian Road? The playoff semi final match and the playoff final match.